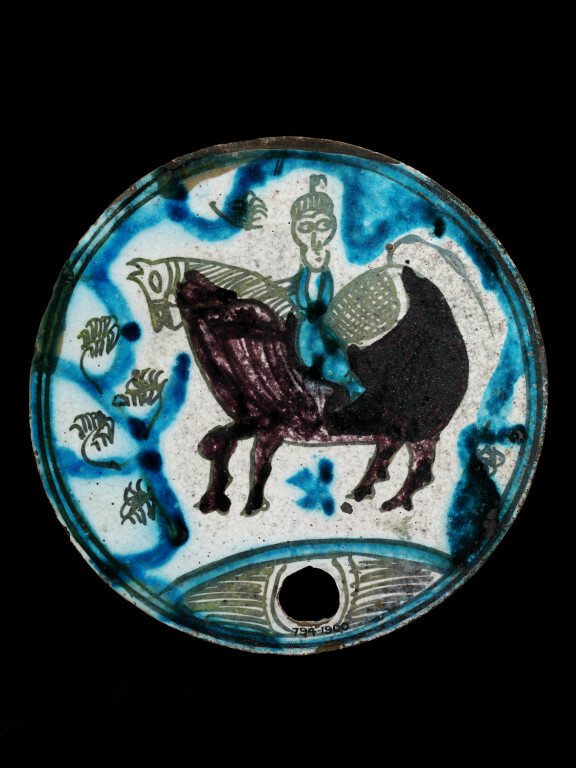 Plaque, earthenware, circular piercd with a small hole at the base, covered with a white slip and painted in blue, olive green and manganese purple with a man on a large horse surrounded by foliage, glazed. Made for inserton in a wall as a cover for a bee-hive or recess. 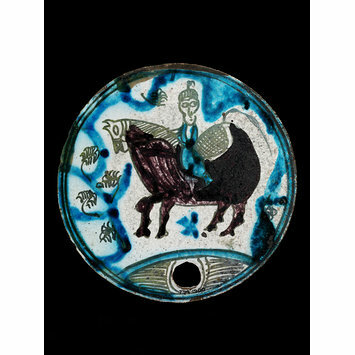 Originally catalogued as Syrian. Traditionally, horizontal cylindrical bee hives were used in Iran. They were made of woven reeds or cane and smoothed over with mud that was then allowed to dry. One end was sealed with a pottery roundel such as the ones shown here. The other end was closed with a wicker or wood plate. The hives were stacked in rows and then covered with mud and straw to insulate them against excessive cold in Winter. Increasingly, such hives have been replaced by modern wooden box hives.